Vicious Custom Maserati V8 Powered Motorcycle Will Blow Your Mind! There are men and women all over the world putting their knowledge and skill for building and customizing bikes to the test. Creative minds like that love to create bigger, better, and badder creations then the last and in this video we get the pleasure of checking out one killer custom build that is sure to excite any of our viewers. 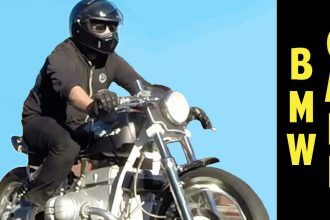 Instead of replacing the engine of the original motorcycle with a small displacement engine the man in charge of this beastly custom bike decided to fit the motorcycle with a monstrous V8 engine that he pulled from a Maserati! Just looking at this incredible creation you can tell it is a true beast on the streets. We are lucky enough to hear it rev up and show off it’s engine power! To check out this stellar custom bike click the video below! 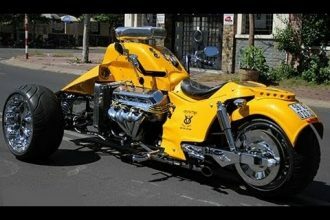 Absolutely INSANE Boss Hoss Trike With 502 Cubic Inch V8!!! 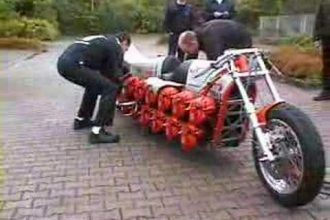 Unbelievable Motorcycle Powered By 24 Chainsaw Engines!